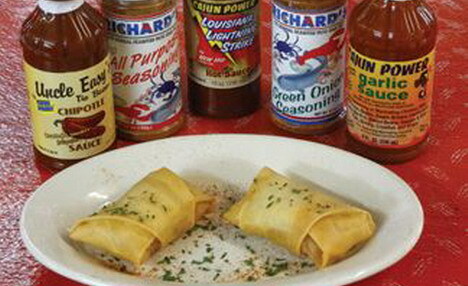 « Homepage / Food and Healthy Eating / Recipes / "Crawfish Roll-Ups"
Melt butter in large pot. Add onions, bell pepper, and garlic. Cook until onions are clear. Add Richard’s seasoning and mix well. Add crawfish and onion tops. Cook until all crawfish tails are curled. Add mushroom soup and cheddar cheese soup. Cook until mixture begins to bubble then remove pot from stove. Add in cooked rice and mix well. Put in refrigerator over night. Remove mixture and starting at the corner of a spring roll wrap place a good spoonful of mix and roll tightly. Don’t forget to tuck your corners in to keep mix from leaking out. Water may be needed to keep roll-up closed; use very little water on tip of spring roll. Once all mixture is used and roll-ups are placed on a tray lined with wax paper, place trays in freezer overnight. Heat deep fryer to 350 degrees and let oil get hot. Carefully drop frozen roll-ups one at a time and cook for 10 minutes. Do not overload your fryer. For best results cook four to six at a time. Here you can write a comment to the post "Crawfish Roll-Ups"